I can’t imagine not having pets, whether I’m living here on Earth or in outer space. Fortunately my parents felt the same way so at a fairly early age I can remember us having white rabbits – Meadow and Thicket. I know not everyone is a pet fan, or can have one for various reasons, and you can certainly love animals and not have one in the house. All animal lovers welcome here! 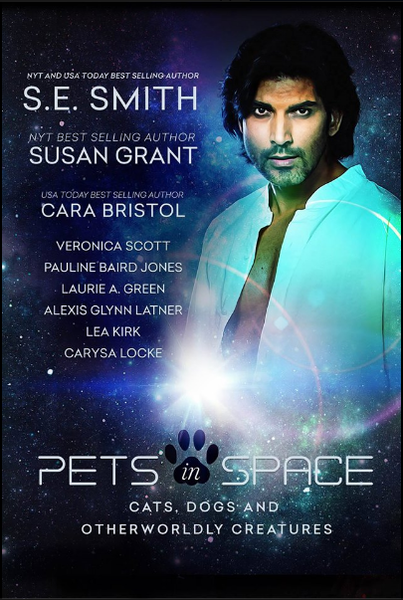 Later last year, author Pauline Baird Jones and I started thinking about doing an anthology mixing science fiction romance and pets. We invited a few of our author friends to join us and it was fun to see what nine authors will do when they start from the same basic story prompt – totally different stories, I promise! I always had cats – the first one was Cinderella Pussytiptoes and she was kind enough to produce nine kittens for my amusement one summer! (My parents weren’t as excited.) We kept two of them, Amy and Nancy, and found good homes for the others. Since we lived in the country at the time, for each cat there came the morning when she failed to return home from nighttime roaming, no matter how long and hard I stood outside calling “kitty kitty”. I was inconsolable each time the cat population at our house went down by one more. My parents regaled me with a story of them living happily in the forest. While I was pretty young, the tale was sort of similar to the Santa Claus story – I wanted to believe it, despite some suspicions it might not be true. I never asked too many probing questions. 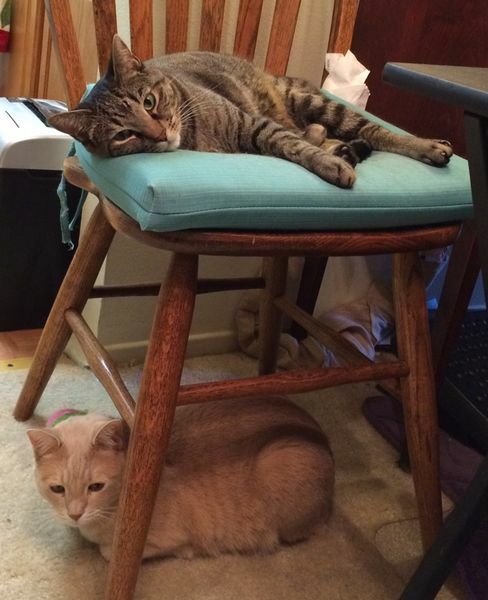 I currently have two rescue cats, Jake and Keanu, who supervise my writing from the chair next to my desk. So of course my story for Pets In Space includes a cat – Moby, who’s a dainty white rescue cat. There’s also an alien pet, Midorri, who’s cat-sized, green with six legs and all kinds of interesting abilities. She and Moby get along fine and rule the spaceship. Of course! Hey both ‘belong’ to Owen Embersson, the ship’s cargo master. “Wait a second.” He stepped aside, encouraging the animals to do so as well. He imagined a gush of whatever was leaking when Maeve did her hacking thing and overrode the container controls. Midorri tried to climb over his boot to return to the growing puddle. A loud click echoed in the cargo bay and the seams on the crate glowed yellow, unsealing in a smooth progression along the rim. 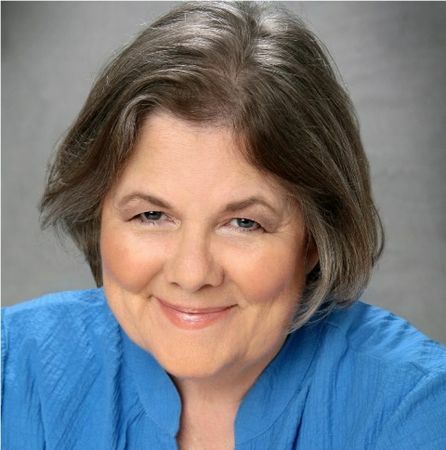 Best Selling Science Fiction & Paranormal Romance author and “SciFi Encounters” columnist for the USA Today Happily Ever After blog, grew up in a house with a library as its heart. Dad loved science fiction, Mom loved ancient history and Veronica thought there needed to be more romance in everything. When she ran out of books to read, she started writing her own stories.